Part of the research I did for Berwick 900 last year was about a Coldstream lad, John Hamilton Hall, born in 1799, whose father was not only a general physician but also a Freeman of the Berwick-upon-Tweed Guild. Seeing his name and occupation in the Guild records led me on an interesting and puzzling hunt for information about his family, his career as an officer in the East India Company’s Bombay Infantry. 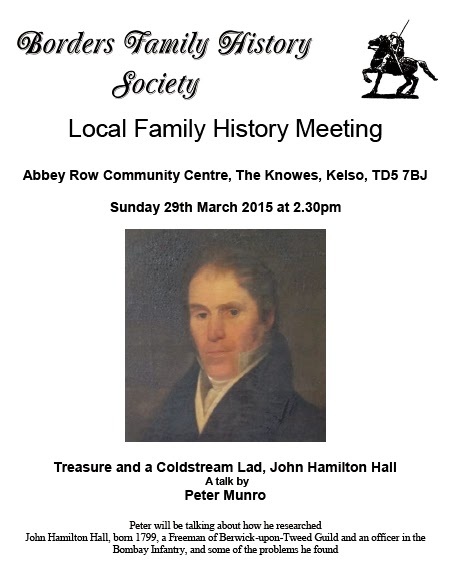 On Sunday, 29th March, at the Abbey Row Community Centre, The Knowes, Kelso, TD5 7BJ, I’ll be talking about his life and career, however, just as importantly, I’ll be discussing how I researched him, some of the problems I found and the difficulties in reading and understanding the records. Map. The talk has been widely advertised, including in Berwick, due to local Berwick interest, so come early to get a good seat. We'll have a range of family history publications available to buy, and there’ll be light refreshments (donation expected) available after the talk. If you have a problem with your family history, please discuss it with one of our volunteers. Many Scots (including one of my ancestors) went to fight as mercenaries for the King of Sweden, so perhaps they married and had a family there. Leith and Berwick were major ports for hundreds of years, it's fairly likely that some of the sailors would have been Swedish, whether on Swedish ships or on ships from Denmark, Estonia, Finland, Germany, Latvia, Lithuania, Poland, Russia participating in the Baltic Trade. Perhaps some of those sailors decided to drop anchor and stay in the Scottish Borders or Northumberland or were stranded when their ship sailed without them; a few such sailors are mentioned in the Poor Law records. Perhaps one of them was your ancestor. To celebrate Genealogy Day in Sweden, which is on 21 March, ArkivDigital is offering free access to Swedish records in their collection at the weekend. Sweden is one hour ahead of us so the free period is from 11pm on 20 March to 11pm on 22 March. You'll need to register and download the ArkivDigital program. There's also a useful guide to Swedish genealogical records. If this helps you to widen your family history, please let us know. What's Buried in the Garden at Coldingham Priory ? Duncan Hale of Durham University will be talking about findings from a recent geophysical survey in the Glebe field (the ground around Coldingham Priory), Coldingham, at Coldingham Village Hall, on Friday, 20th March at 7.30pm. The event is free and tea/coffee will be available. I hope you're making good use of FindMyPast's free weekend. Find My Past is offering you the opportunity of almost all its records until midday on Monday, March 9th (GMT). It does include parish records, censuses, military records, newspapers. You'll need to register and sign in. Records not included are the UK Electoral Registers (2002-2014) and the UK Companies House Directors (2002-2014), however that's no drawback for most of us. Search on the free weekend offer.